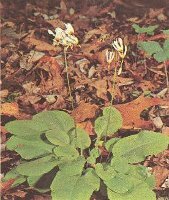 Dodecatheons, or American Cowslips, are hardy perennial free flowering plants native to western America and belonging to the Primrose family, Primulaceae. They form leathery rosettes of leaves growing low to the ground and sprout stalks from the center from which grow clusters of star shaped blooms. 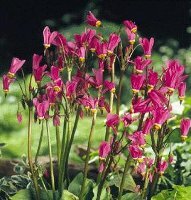 They make excellent rock garden or woodland plants. The prefer moist, rich well drained soil in a shaded or partially shaded location.